Firefox is mainstream, Chrome is gaining fast, and even Opera is a significant player these days with its 2.35% global market share in February (more than half of Safari's 4.45%). However, there are still a gaggle of other browser choices that cumulatively share about 1% of the total browser market. In my ongoing quest for up-to-date, high-performing browsers that still support PowerPC Macs running Mac OS X 10.4 "Tiger" - such as my two treasured Pismo PowerBooks - I've been giving the Japanese based Shiira version 2.3, released a couple of weeks ago, a fresh checkout, and I'm finding much to like. Safari 4 works decently well on my old G4-upgraded Pismos, but it's a resource hog that tends to corrupt the memory heap, requiring more frequent reboots. Shiira starts up a bit (not much) slower than Safari (which presumably benefits in that department from its close integration with the OS), but it seems more lithe, lively, and a better software citizen in general. Because it's based on the same WebKit rendering engine as Safari, Web pages display pretty much the same in Shiira 2.3 as they do in Safari. Shiira 2.3 is also proving to be very fast - both loading pages and in Finder responsiveness - certainly one of the fastest OS X browsers I've experienced in Tiger on a PowerPC Mac, if not the fastest, and it has an attractive and genuinely innovative user interface and feature set that are as interesting as Safari and Firefox are dull. Shiira uses the same WebKit rendering engine as Safari. 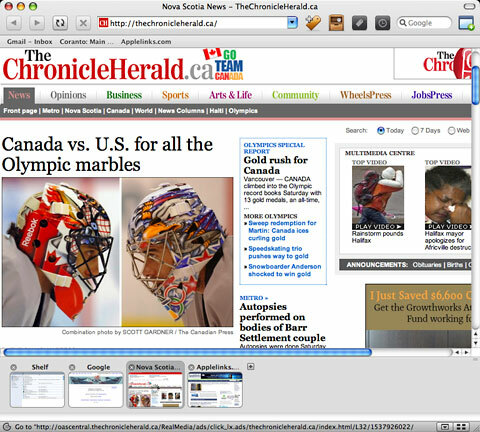 Shiira is is delightfully small (the compressed download file is only 8 MB) and has interesting features, like its "Page Dock" thumbnail icon type tab bar, located at the bottom of the browser window rather than at the side or along the top, which displays mini-previews of open browser tabs. I'm not a big fan of thumbnail tab icons, but Shiira provides settings options that make them more tolerable, including the facility to resize them by dragging the window/tabs partition up or down and a convenient button that dismisses them entirely, giving you the full depth of the application window for displaying content. There's no conventional page load progress bar, but the thumbnail icons progressively fill with blue as each page loads. This is pretty cool once you get used to it. I'm not terribly smitten with Shiira's download manager. It's serviceable but has no frills. There is no pause and resume download function. I wish there was a way to reposition the thumbnail tabs to the sides or top of the UI window. Well, maybe there is. I wouldn't know, since I can't persuade any of Shiira 2.3's Preferences panels to open and reveal what settings options are available. This isn't a glitch peculiar to my install of Shiira 2.3 on the old Pismo. I tried downloading a fresh copy on my Intel MacBook and encountered the same bug. The Preferences window opens, but clicking on various category icons elicits no response. Hopefully this will soon be patched. Aside from that, I haven't encountered any other major bugginess so far in Shiira 2.3, although there are still plenty of rough edges. Based on forum reports I've seen, not everyone has been as fortunate, especially running Shiira 2.3 with OS X 10.6. For example, a cool Shiira feature borrowed from Apple's OS X Exposé playbook lets you click a button at the bottom of the browser window, and all open tabs display, downsized appropriately to fit the screen space available - in theory. This worked great in version 2.2, but like the Preferences, it refuses to function at all in 2.3. On the other hand, program stability, not a particularly strong point with versions 2.1 and 2.2, has been impeccable so far with version 2.3 in more than a week's use. With version 2.3, Shiira has received another user interface refreshment - something its developer seems to like doing more frequently than is customary. I actually have mixed feelings about Shiira's interface. On the one hand, it's aesthetically attractive with very nice toolbar icons, although unfortunately no mouseover tooltips to clue you in to what the various buttons do. The basic backward/forward/reload/stop-loading set are intuitive, but the others require some experimentation to suss out what they do, since documentation is minimal and there is no English language Help file. A major Shiira 2.3 shortcoming, at least as far as I can determine without access to the Preferences, is lack of the session restore function to pick up where you left off after a restart without reloading all your open pages from scratch that users of Opera, Google Chrome, Firefox, Camino, and (in a somewhat clumsy implementation) even Safari all enjoy. This feature omission is a major pain once you're used to having it. Shiira's "Shelf" lets you use Firefox and Safari bookmarks. 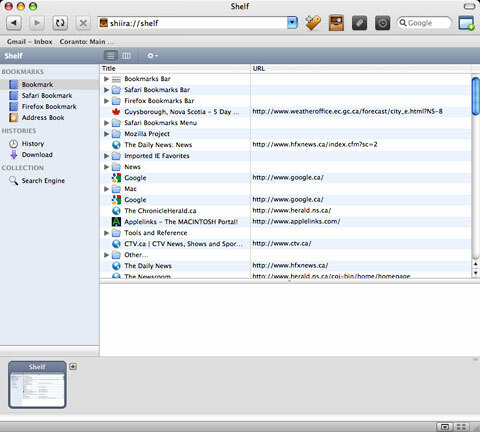 There's no provision to import bookmarks from other browsers into Shiira's main Bookmarks menu, but a major mitigation of that is Shiira's "Shelf", which opens up access to Safari and Firefox bookmarks and allows you to monitor and manage bookmarks, downloads, history, and search engines all within the main browser window. Shiira's handling of PDFs is also a bit raggedy, but on the plus side you can save any Web page as a PDF document from the File Menu in Shiira, which is convenient. OS X Services (still missing in Firefox) are supported, meaning you can export selected Web page content into, say, TextEdit Plus or DEVONthink with a menu selection. Shiira is definitely a work in progress, but within its limitations it works nicely - and with speediness that counts for a lot, especially on older Macs. It really flies on Intel Macs. If you haven't tried Shiira, I think you'll find it worth checking out. Low End Mac rating: Only 2 out of 4 until they get that Preferences bug squashed and add session restore, but I'm finding myself not in any hurry to stop using Shiira 2.3 and go back to Safari 4 as my WebKit browser pick.